Another day where sellers dominated for much of the session, although it was choppy and early weakness was offset by better than expected jobs data out at 11am. That prompted some strong buying amongst the banks simply given its another incremental piece of data that goes against the growing calls of a looming recession. As we’ve suggested many times before, employment remains to real key to the domestic economy and the trends here remain strong. Challenger Group Financial (ASX:CGF) was weak today after a profit downgrade + weak guidance, more on that below while embattled Wealth Management business IOOF (ASX:IFL) was hit hard after Macquarie released a fairly scathing report, suggesting that IOOF could be hit with further expenses of A$600m for client remediation – a big number and the stock fell by 8.2% as a result. AMP was also discussed and that stocks ended down -1.52% at $2.59 – simply a horrible time to be in either stock at the moment. In other news, Gold producer Northern Star (ASX:NST) released a weak Dec quarter production report and that prompted a big rotation out of NST into the other mid-tier names, particularly Saracen (ASX:SAR) which added +4.86% and Regis (ASX:RRL) which added 3.77% while NST languished down -5.65% to close at $8.68- clearly some big rotation amongst the gold names there. Cochlear (ASX:COH) finally broke back through $190 to close at $193.07, up 1.74% on the session and is now up ~25% from the recent lows. Overall, the ASX 200 closed down -15points or -0.26% to 5843. Dow Futures are currently trading up 48pts. Broker Moves; Deutsche did a deep dive into the local healthcare sector today which produced some mixed messaging. The bank downgraded sleep apnoea business ResMed, but upgraded medical supplies company Ansell after seeing a divergence in operating environments. The analyst said domestic facing businesses will likely struggle with slowing growth in GP and hospital markets, but the global operating environment is faring much better. IOOF (ASX: IFL) and AMP (ASX: AMP) were both sold off today on reports that they may need to increase provisions for customer remediation on the back of the Royal Commission. Macquarie bank commented that the wealth firms both seem to be underestimating the total rebate figure they may be liable for – potentially over $2b short! 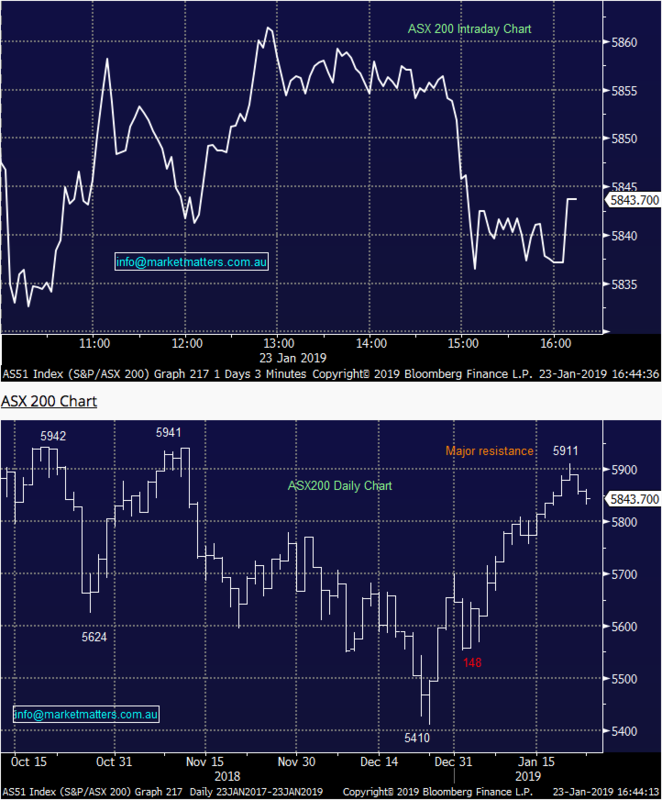 As if the market wasn’t pricing in enough negativity around the situation… IOOF (ASX: IFL) was dumped on the report, falling -8.2%, while AMP was down -1.52%. 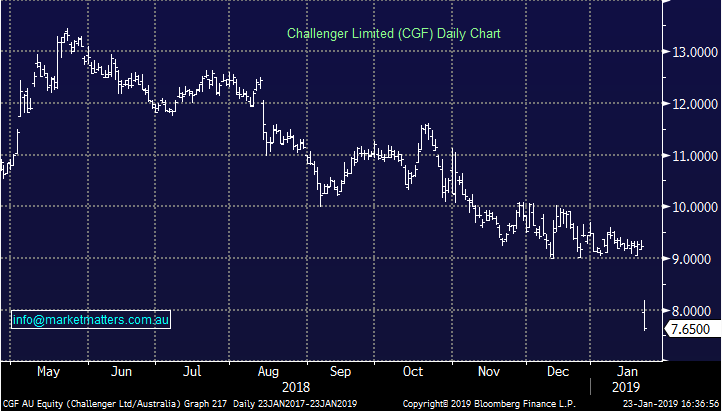 Challenger (ASX: CGF) $7.65 / -17.12%; tumbled this morning on the back of management lowering guidance for the upcoming half year result and also for the FY19 due out later this year. Now expecting a pre-tax profit of $270m for the half year, and between $545m and $565m in the full year, the updated guidance suggests growth of 0-3%, well below previous guidance of 8-12% growth. The new figure is also ~6% below the consensus figures for the year end. Key drivers of the disappointing update were poor performance in the Life absolute return portfolio and falling performance fees which fell 67% from the previous comparable period. Despite the short term troubles, CEO Richard Howes remains confident in the longer term performances saying the company “continues to be well placed to take advantage of growth in the retirement income market.”An 8% downgrade forces the stock 17% lower – seems disproportionate at this stage although the company did miss at their FY18 result and the struggle continues. There is certainly longer term value here however there is still room for more short term pain. We have 3% of the MM Platinum Portfolio in the stock and we see no reason to average into current weakness. The deteriorating earnings place the dividend under some pressure and there will be growing calls now for a capital raise. 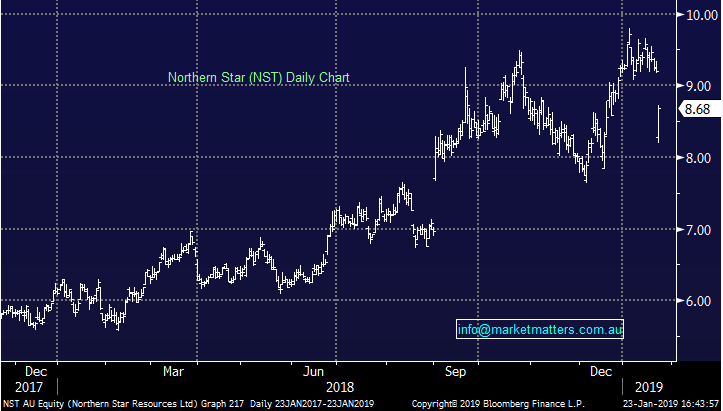 Northern Star (ASX: NST) $8.68 / -5.65%; one of many resource stocks to publish quarterly production today, but one of few that missed expectations. Northern Star was savaged early, reaching a low of $8.195, or -10.9% below yesterday’s close. The gold miner saw flat production for the December quarter, but costs creeping higher. The profit number will certainly benefit from the near record high gold price (in AUD), however this is a known known and the cost creep and flat production clearly rattled markets. The company also made a ‘strategic decision’ to mine the lower grade ore (partially contributing to the cost creep) – a decision the market saw in a negative light but one that will likely prove positive to future earnings. Sold off today, and rightly so, but one to keep an eye on if looking to trade gold.